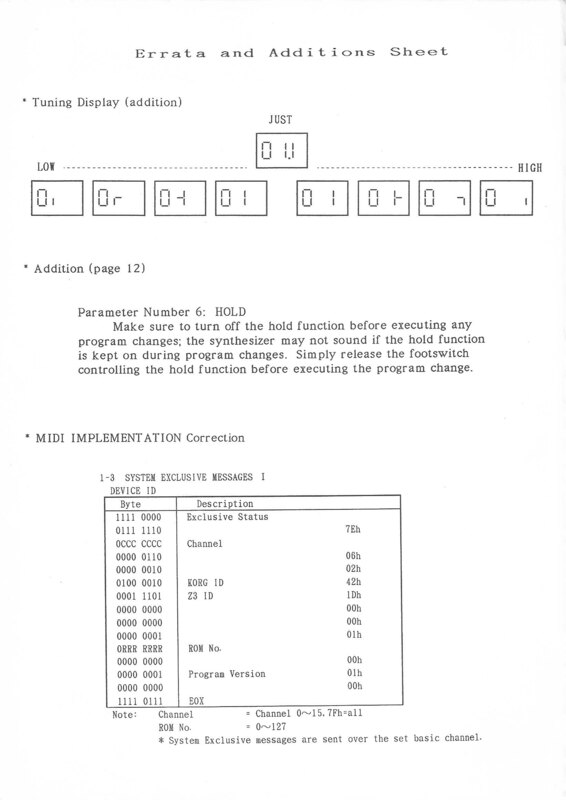 For an encore to my two columns on guitar synthesis (July and August 1982 issues), here are three simple modifications that let you get more out of the Roland GR-300 guitar synthesizer system. 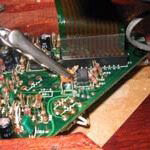 You won't have to drill any holes in either the GR-300 electronics or G-series guitar, or even remove any circuit boards. The only cautions are: Solder with a fine-tip, low-wattage soldering iron (no more than about 40 watts), use rosin-core solder, unplug the GR-300 before working on it, and finally, don't forget that doing these mods will void your warranty. Now, on to the three mods. 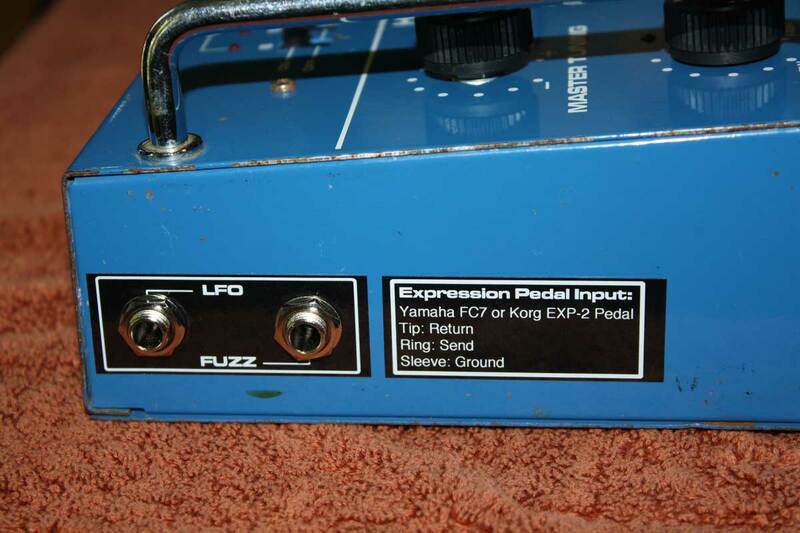 The hex fuzz section of a Roland G-series guitar (which is built into the guitar) mixes the fuzzed signal from each string into a single output. Note, though, that this hex fuzz mixer starts rolling off high frequencies around 2k Hz. To eliminate this roll-off, remove the metal plate on the back of the G-series guitar's body (the one on the other side from the controls and switches). Next, orient the guitar's circuit board so that the lettering is right side up, and look for the capacitor labeled C72 (470 pF). On my guitar, this cap is located a little to the right of center of the board, in the upper middle section. Once you've found the cap, snip one of its leads with a diagonal cutter - you will be rewarded by a brighter fuzz sound with more presence. Interior G-303 guitar. The clip is attached to C72, located just below the ribbon connector. Interior G-303 guitar. The yellow arrow points to C72. 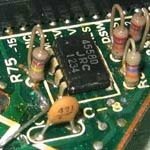 C72 is a flat, ceramic capacitor. Interior G-505 guitar. The yellow arrow points to C72. The layout is similar to a G-303. Interior G-505 guitar. Note C72 in the lower left corner. The op amp IC8 is part of the hex fuzz. This mod (which is particularly effective for studio work) taps off the hex fuzz output and routes this signal to its own output jack (the original hex fuzz signal path remains undisturbed). Thus, you can send the hex fuzz signal, VCO signal, and straight guitar all into separate channels and process them individually. The hex fuzz would come from the jack we're about to add, the VCO output from the mix/synth jack (with the guitar's balance control set for all synth and the dist/VCO switch set for VCO only), and the straight guitar sound from the guitar jack. With a little processing, you will get some absolutely incredible stereo effects. To install the hex fuzz output, take off the bottom plate (12 screws). Orient the unit top-down, so that you are facing the rear panel. This jack connects to two ribbon connectors, which plug into matching sockets (B4 and B5) soldered to the circuit board. Fig. 1 shows a detail of the left side of B5. Note the designation "6 SG" just above the left side of the connector, "3 SG" to the right of that, and a solder connection to the right of "3 SG." 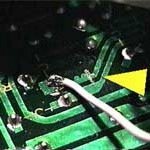 A jumper wire goes from this solder connection to another solder connection directly above it. Both of these carry the isolated hex fuzz signal. Decision time: It you don't want to drill any holes in the GR-300, you will have to give up one of the jack functions on the back panel so that this jack can carry the hex fuzz out. I recommend giving up either the string select or sweep on/off jack. Both of these have three terminals; the ground terminal busses to the other jacks via bare wire, one terminal is unsoldered, and the remaining "hot" terminal (the one closest to the circuit board) has a colored wire going to it. Disconnect this soldered wire and tape up the end, so it won't short to anything. 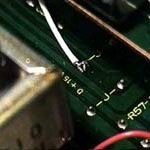 Connect the "-" end of a 10 micro farad electrolytic capacitor and one end of a 100K resistor to the hot terminal. Connect the other end of the resistor to the ground terminal, and the remaining end of the capacitor to a wire whose free end solders to either of the jumper solder pads shown in Fig. 1. You now have an individual hex fuzz output. This diagram is from the original article, but refers to the version "A" circuit board. The most common version is "B" or "C". The yellow arrows points to the connection point I used. 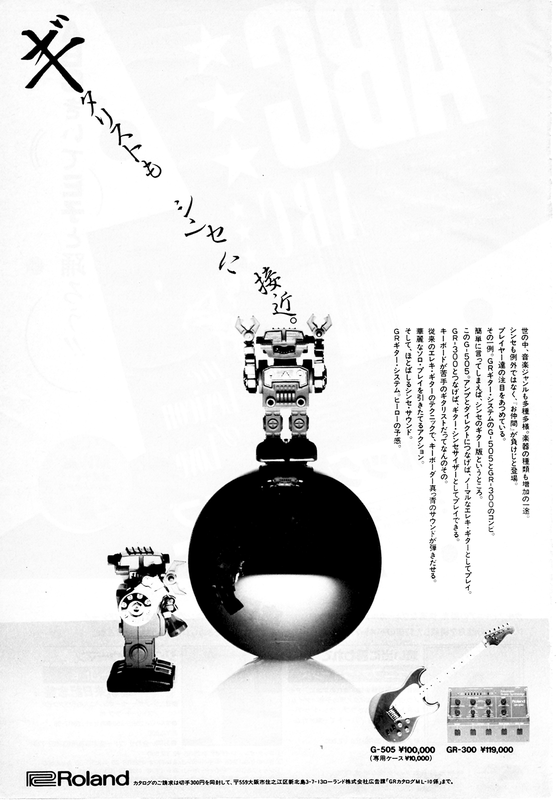 Photos from "C" version GR-300. 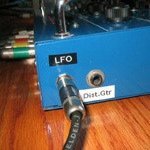 LFO jack and the separate, distortion guitar output jack. I don't like the GR-300's vibrato touch plates, so I disabled them and added a foot pedal option where pushing down on the pedal increases the vibrato depth. The pedal must be a control voltage pedal,as described in my article in the February 1982 issue of Keyboard magazine (page 24). Otherwise, use a standard volume pedal, connect a 9V battery connector to a 1/4" phone plug (red wire to hot, black wire to ground), and insert the plug into the pedal's instrument input. 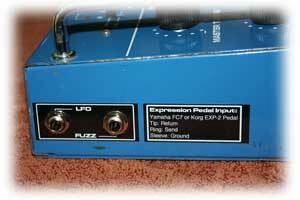 As you push down, the pedal output will go from 0 to 9 volts. 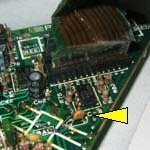 As with the last mod, you will have to give up another jack's function; I recommend the VCF pedal jack's hot terminal (the closest to the circuit board), and re-solder this wire to the ground terminal. Now, referring to Fig. 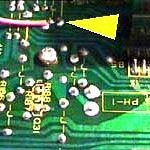 2 (which details the right side of B4), use an X-acto knife to break the circuit board trace where indicated. Next, follow along the right-hand side of the circuit board. 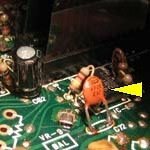 As you move towards the foot switches, you will see the legend for resistor R179 about two-thirds of the way up the board and about an inch from the side. Move towards the foot switches from this point, and you'll find a jumper wire (see Fig. 3). Solder a wire to the right of this jumper, and connect the other of this wire to the hot terminal of the VCF pedal jack. Check your wiring over carefully, make sure you didn't short out any adjacent traces (important! ), and reassemble the unit. Plug a control voltage pedal output into the VCF pedal's input to verify that the pedal vibrato function works, and also check that there's a signal present at the new hex fuzz output jack. If all is well, play away! This diagram is from the original article, referring to version "A" circuit board. This is a photo of the connection near B4. 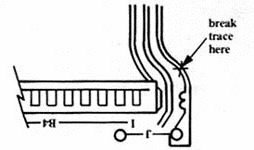 The yellow arrow points to the cut in the circuit trace. This is the second jumper, near the power transformer. Revised Anderton Modifications. Click for larger view. After around 10 years, I have some suggested revisions to the original Craig Anderton modifications. Typically, these came about as the result of a suggestion by a GR-300 user. User Giotto asked me to make these modifications when I was doing the ALG Audio Labs of Georgia output upgrade to his GR-300. I liked these new revisions quite a bit, they add a lot to Craig's original modifications, they do not require a battery for the LFO pedal, and offer a great deal of flexibility with the hex fuzz sound. 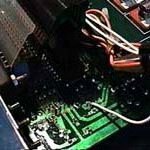 In addition, all the changes are made by working on the ribbon connector, so you do not have to completely disassemble the GR-300, or make changes to the main circuit board. You can have a look at my notes for this work. I used a Neutrik NSY234 tip-ring-sleeve for these modifications. If you watch the YouTube video play list below, you can get all the details on how this modifications was done, and how it works..